Perennial herb from a branching, thickened stem-base; stems erect, several, simple, finely hairy with short, appressed or loose hairs, 1.5-15 cm tall. Basal leaves abruptly contracted to stalked, with broad, elliptic to egg-shaped or almost round blades, entire, 0.5-8 cm long, 4-13 mm wide, hairy like the stems; stem leaves few, reduced and narrow. Heads with ray and disk flowers, solitary, the disks 7-16 mm wide; involucres 5-8 mm tall; involucral bracts loose, equal, leafy and sometimes tinged with red, sparsely to densely long woolly-hairy, the hairs sometimes with purple cross-walls; ray flowers mostly 25-70, yellow, 6-9 mm long, 1.4-2.5 mm wide; disk flowers 3.5-5.0 mm long. 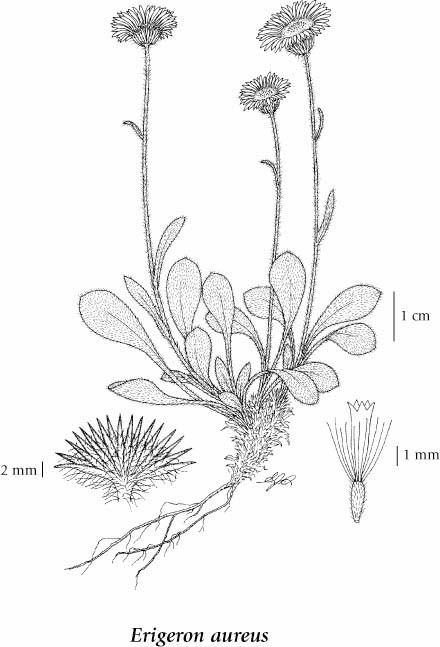 Achenes hairy, 2-nerved; pappus double, inner of 10-25 bristles, outer of short bristles or narrow scales. Tonestus (Haplopappus) lyallii, a somewhat similar alpine species, is easily distinguished from Erigeron aureus by its abundance of glands. Mesic to dry meadows from the upper montane to alpine zones; common in S BC east of the Coast-Cascade Mountains; E to SW AB and S to N WA.